Dr David Hu is a fluid dynamicist with expertise in the mechanics of interfaces between fluids such as air and water. He is a leading researcher in the biomechanics of animal locomotion. The study of flying, swimming and running dates back hundreds of years, and has since been shown to be an enduring and rich subject, linking areas as diverse as mechanical engineering, mathematics and neuroscience. 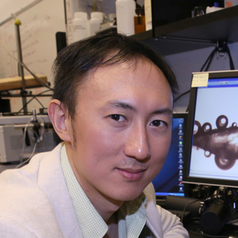 Dr Hu’s work in this area has the potential to impact robotics research. Before robots can interact with humans, aid in minimally-invasive surgery, perform interplanetary exploration or lead search-and-rescue operations, we will need a fundamental physical understanding of how related tasks are accomplished in their biological counterparts.